Hello, folks! I know, I know, its way too soon to be sharing Christmas cards, but I simply cannot help myself. When I discover something I really love (like the combination of ombre inks and a background stamp) I simply must use it to make a card and even a video if I have the time. 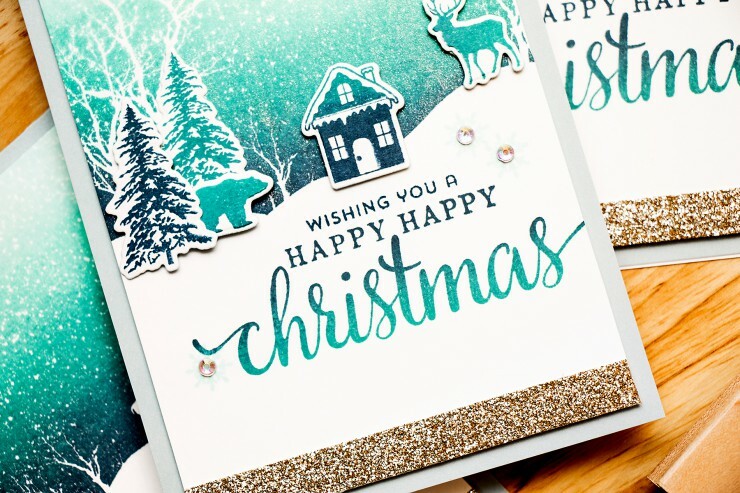 So today I’m going to show you my new favorite way to use ombre ink pads to create a gorgeous background for a winter (or Christmas!) card. And see all of that snow on the middle card and the one one the right? Doesn’t it really look like snow to you? That’s all Wink of Stella Glitter Pen. Compare the card in the middle with the one on the left to see how big of a difference you can get. Gorgeous! I used a Snowy Scene woodblock stamp together with Pool to Navy ombre ink pad and a Soft Pool ink from Hero Arts to stamp this stunning clean background. Because I used an ombre ink pad the sky looks as if I had blended the colors over images that were masked or heat embossed in white or clear. When in fact all I did – was inked a background stamp using an ombre ink pad. So beautiful! I seriously cannot stop loving this background (so now you see why I had to share these cards way before Christmas). I struggle with ink blending so using an ombre pad is a fantastic alternative for me. I used the same Pool to Navy ombre ink pad to stamp the sentiment and a Soft Pool ink pad to stamp the snowflakes. I also added a strip of glitter tape to the bottom of this card, I’ve seen Lisa Spangler do this a number of times and I just love it on her cards! So festive! thank you so much, Lynn! Its comments like yours that make me want to create more! Thank you! 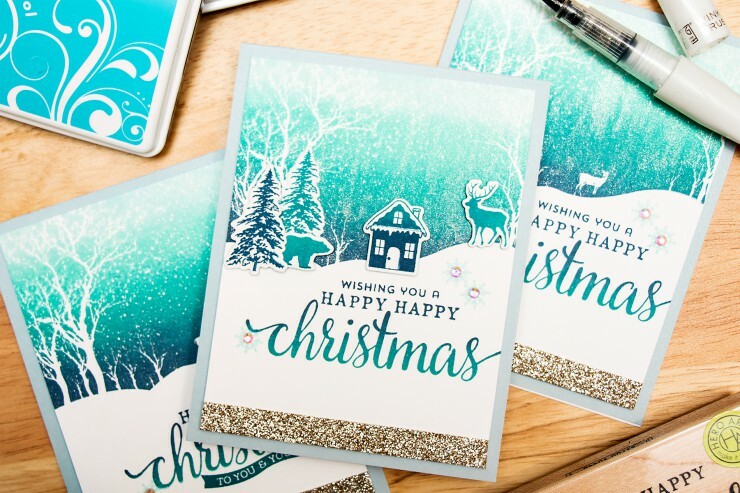 Love your card – I wish it was snowing! What a beautiful card! I don’t think it’s too soon to start making them! Thanks for sharing. Simply wonderful – love every single detail! Fab video and instructions too!! Love this ombré technique, such beautiful cards. I cannot find the link to the ones at the end of the video, the ones with the jar. This is just gorgeous Yana! 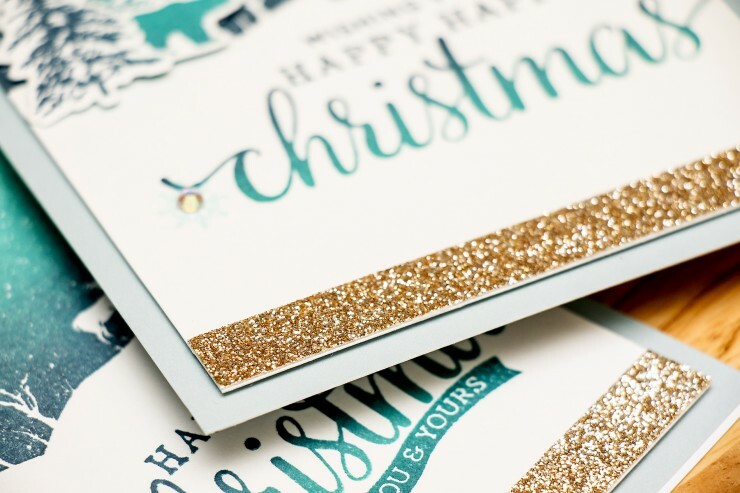 I love that ombre inking and the little touch of glitter tape is awesome too! I just ADORE this card! I may have to mass produce some of these myself. So simple but beautiful. Thank you for the idea! Great cards!Thanks for the tutorial! What a beautiful card! I really enjoyed the flow of your tutorial. I am so happy I cam across your work on Pinterest. I will be back. Thank you for sharing your time and talent. awww, thank you so much! welcome back anytime! Yana, there isn’t one card I love because I love them all. Don’t you just love the ombre stamp pads? The Christmas cards are very inspiring and on the card list for Christmas. Thanks for sharing your talent! Keep it going! You motivate me !